Institute Of Management Sciences Lahore admission 2019 are now open for all the programs that they offers. All the candidates who are going to apply for admission in Pak Aims 2019 should read all this article because here they can get complete information about AIMS Lahore Admission 2019 last date, advertisement, entry test, form download and submission, merit list and fee structure along with eligibility criteria. 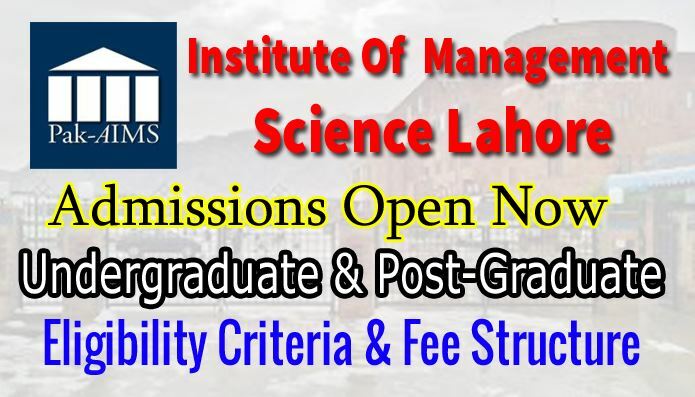 Institute of management science Lahore spring admission 2019 application form can be download from page easily. You just need to fill the form and return to the university and hence you will be enrolled for admission. Pak AIMS admission 2019 last date is mentioned on the advertisement given below. You can also get all the latest news & updates about aims admission 2019 from here. Insititute of management sciences Lahore is one of the famous university in the Pakistan by HEC ranking. Higher education commission put this university In “W” category that shows its efforts and hardwork. HEC put only those universities in w category which are top ranked have all the study related best stuff there. Institute of Management Sciences Lahore made their name in few time and all this is because of hardwork and passion. University offers admission twice a year in semester system. One semester is spring semester that starts from the march april and second starts from September October. Candidate who wants to be a part of this institute can apply for admission through proper way. Every year large number of students apply for admission but only excellient and brilliant students got admission there. 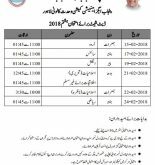 Pak AIMS Lahore Admission 2019 details you can find here. MSC in Web applications, Development, Mobile Applications Development, Database System, Software Engineering, Computer Network & Communication. To get admission in this institute you must follow the process given by university. You have to walk through institute campus and collect prospectus that contains the all guidance and information about Pak AIMS and the most important, application form will be there in prospectus. Fill that form carefully because false information providing may cancel your admission at any stage. Deposit the admission processing fee and attach the challan copy with required documents and submit it to the admission office. Institute of management Sciences was established in 1986 on the name of Canadian school of management learning center but after some years its name was changed but in 1995 university was chartered by Pakistan government and in 2001 once again college name was changed to Institute of management sciences Lahore. Now it have two sub campus in Lahore. One in gulberg III and second is in Canal View. Note that all this information related to Institute Of Management Science Lahore Admission 2019 is collected from different online sources but for authentic news & updates of Pak AIMS Admission 2019 & pak aims spring admission 2019 visit official website. Webstudy.pk is right place for you if you are looking for universities admission details and merit list download. You can download free guess papers, model papers, past papers and important notes of each class and subject.